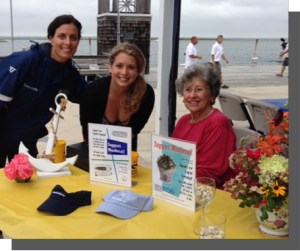 Lisa Schroeder, Jane Kleber, and Marilyn Thomas at last summer’s “Paddle & Pour” paddleboard fundraiser. What a difference a year makes. Last year at this time we were about to embark on a Capital Campaign to raise an additional $200,000 toward our local cost share for the Mordecai Island Coastal Wetlands Restoration Project (“Breakwater Project”). The contributions to the Capital Campaign had a terrific response. Our fundraisers were made possible by the support of an army of dedicated volunteers and the community at large. Last summer was the summer of Mordecai. By April of this year, the NJDEP and MLT had both signed off on the form of the Project Participation Agreement (PPA) which is presently in the final stages of review at Army Corps with signing anticipated in late May or June. After that, the Project should move up the list with other “shovel ready” projects for federal funding. Of the approximately $6.6 million of maximum costs estimated for the Breakwater Project, 75%, will come from federal monies and, of the remaining 25%, 75% ($1,245,000) will come from the NJDEP and 25% ($413,044) from MLT. The Breakwater Project likely will include rock as rock structures are effective at attenuating wave energy, the main culprit in Mordecai’s erosion; require little or no maintenance; and combined with “living shoreline” components, would help to stabilize the shoreline and promote its habitat. Also in the mix, but outside of the Breakwater Project, is the beneficial use of dredge material in the cut through Mordecai. The State of NJ (Office of Sediment and Dredging Technology) requires more sediment testing before the project can proceed and Army Corps is working on getting a contractor in place to do the required tests and analysis. If approval is granted, the cut dividing the island, a major area of concern for its high erosion rate and habitat loss, would be eligible for beneficial use of dredge material from the vicinity of the Intracoastal Waterway. This beneficial use of dredge material on Mordecai would complement the larger Breakwater Project and does not require funding by the Trust. So this next summer and year will be one of anticipation while we await federal funding and finalization of plans for the Breakwater Project, and the beneficial use of dredge material in the cut on Mordecai. Jim Dugan, MLT trustee, is working on a Project with ReClam the Bay to develop an Oyster Living Shoreline on the geotubes on the southwestern side of the island (see page two for a full article). Former MLT president Mike Davis and Wes Heilman are manning an upweller this summer, growing oyster spat on Norwood Avenue, that will, hopefully, eventually create a living reef on the western side of the island. Our 2015 calendar of events is full. The work and the challenge continue.